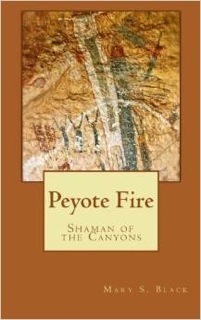 My guest today is fellow prehistoric fiction author, Mary S. Black, author of Peyote Fire: Shaman of the Canyons. Mary fell in love with the Lower Pecos more than twenty years ago. Since then she has studied the archaeology and related ethnography of the area with numerous scholars. She holds an Ed.D. from Harvard University and lives in Austin with her husband, Steve, an archaeologist, and two cats. Deer Cloud is painting the stories of the gods when tragedy changes his life. He is called to walk the shaman path and bring the buffalo through his visionary power. The evil Stone Face will do anything to thwart Deer Cloud’s growing in power. But the lusty female shaman, Jumping Rabbit, introduces him to a powerful new spirit herb, and together they change Rain Bringer society forever. This book brings to life people who lived over 4,000 years ago in the southwest Texas canyon lands known as the Lower Pecos, near the confluence of two rivers into the Rio Grande. The people painted over 300 currently know rock art murals, some of which can be viewed today. Evidence of a huge bison jump points to a catastrophic event that changed their lives. What made you choose to write this story? Thanks for inviting me to be your guest today, Sandra. I had visited the canyon lands of southwest Texas many times to see the astonishing rock art and other archaeological sites. Whenever I saw this 4000-year-old art on the walls of the rockshelters, I couldn’t help but wonder who painted it, and what the stories were about. The book Peyote Fire: Shaman of the Canyons grew out of an attempt to answer those questions. The protagonist, Deer Cloud, is painting an important story on the stone wall of a small alcove. The story is important, and is meant to instruct generations of his people. He applies all the black color first, working from a charcoal sketch. Later he will add red, orange, yellow, and white, in specific order. Each color has meaning for him. I had to figure out what Deer Cloud was thinking, and how he planned and executed his painting. The images he paints are quite abstract to us today, but he and his people, the Rain Bringers, understood the shorthand of each stroke. How did you research your story? I took my cue from rock art specialists who are beginning to decipher interpretations of this art after much pains-taking work. I also looked at the mythology and ethnology of the Huichol people in Mexico, whom some have linked with the Archaic people in south Texas. The cosmology in the book is all from the Huichol, and many of the ritual practices as well. Where are these canyon lands that you mentioned located? Can other people see this art today? The setting is along the Rio Grande between the Pecos and the Devils Rivers right on the border with Mexico. Amistad Reservoir cuts through that region today, just west of Del Rio. Archaeologists have documented over 300 different sites with significant rock art in that area. The canyons are very steep and rugged, making accessibility an issue. The best way to see some of the rock art is to visit Seminole Canyon State Park and take the guided tour to Fate Bell Shelter, or make an online reservation with the Rock Art Foundation to tour the White Shaman Shelter any Saturday at noon. White Shaman plays a large role in the book and provides the cover art. How did these people live 4000 years ago? The people I call the Rain Bringers had stone tool technology, which means they used flint to make spear points. In America, the terms we use for this time period are either Paleolithic or Archaic, which both mean “old”, rather than the term “Stone Age,” which is used in Europe. The Rain Bringers lived near three rivers, and undoubtedly there were numerous running springs as well during that time period. They used the available plants to make twine, sandals, mats, baskets, and other things, as well as for food. They did not have pottery. They hunted small game, with the largest animal generally deer, although occasionally they may have gotten a mountain lion or even a bear. And of course they fished. Fishing probably sustained them more than anything. Life was hard, but the people had a cohesive worldview, which helped them make sense of their world. They lived for the group, and not the individual. That concept seems strange to some of us today, but it was only with the power of the group that they survived. I tried to capture some of that in the book. Everyone was necessary, and every role essential. What was the most fun in writing this book? I had a lot of fun writing the animal stories. In the book, the people sit around the campfire at various times and tell stories. I adapted some of these from Huichol myths and some from other American Indian groups. It was fun making the animals talk and dance, especially the wolves, prancing around. It was also fun to write about the buffalo stampede off the cliff. I researched accounts of historic Native American groups who had done that and tried to make it authentic. It was still a challenge to think it all through. I’ve got a travel guide to the region in the works, and am planning a sequel called Peyote Rain. Hopefully it will be out in about 18 months. Keepers of the Ancient Wisdom Will Be Out Next Month! After more than a year as a slave to the brutal horse nomads, Kalie returns to the Goddess Lands to face her greatest challenge. Varlas of the Wolf Tribe has united the clans, and leads his horde to conquer Kalie’s home and replace the Goddess with gods of war and thunder. The only hope for Kalie’s people is her lover, Riyik, and the warriors who follow him. They must turn peaceful farmers into warriors who can defeat Varlas’ mounted host. But not everyone in the Goddess lands will accept this transformation. Kalie and Riyik must fight enemies from without and within to save their home. Thanks again to my many loyal readers. I am hoping this will be the best Kalie book of all!